This is one of several "any hero" thank-you cards I'm enclosing in my final box of cards heading to OWH before they close. I used a retired SU! image and sentiment for this, embossing the image on kraft with gold embossing powder. I drew lines around the Nestabilities Labels 2 die before cutting the image, and then colored with Copics. I put it on a dark green piece of cardstock, and punched 3 gold stars using a SU! mini star punch. The banner was done with SU! framelits and I drew around that with a fine black marker before cutting - just like the image panel. I don't anticipate being able to use this image too often after OWH closes, so I'm making cards to thank our heroes. I'm sharing this with the OWH ODBD July challenge to make "thank-you" cards for our heroes. Enjoy the rest of your weekend and thanks for stopping by. Great job! I'm sorry to see OWH close, it's been a big part of my crafting life for many years and I know it has been for you too. Any hero cards are a great way to "finish strong". It's still so sad about OWH closing it's doors, but your card is just sensational and will be appreciated so much. Love that image and your beautiful card. Some hero is sure going to enjoy this card! A wonderful thank you card Carol, such a fabulous image. Very nicely done. I really like the drawing around the die to add an accent. These are great stamps but indeed, will they be used much after OWH closes? And whatever will you do with yourself??! Love the design, image & stars--great card! 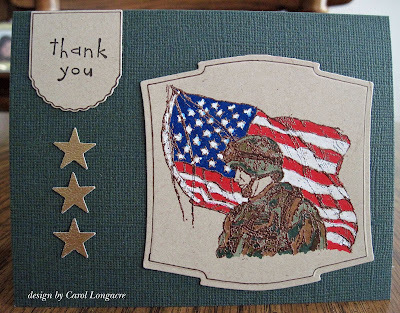 This is a super card, I love the textured card and the gold stars as well as the wonderful image. I really like how you drew a line round the inside edge of the dies, it gives such a stylish finish. I may have to copy that idea! Great design, and I'm sure this nicely done card will be greatly appreciated!